Carrying the BAG is a four part series regarding the women who suffered the loss of their child or children through abortion – the Post Abortive Woman. Abortion changes everyone’s life. About 43% of all women, 45 years old and under are Post Abortive. Nearly half of them will or have aborted again. Abortion kills, abortion binds the hands of God. But abortion is forgivable. God gave us ‘free will’; the ability to choose right from wrong. Throughout the ages, the freedom to choose has destroyed life rather than protect it. The world will tell you that an unborn child is not a ‘baby’ until ____. There is a reason why I left it blank. There are many answers to that question according to the Supreme Court, state and federal law. God is the Creator of everything and everyone. So, let’s go to the Word of God! The big question that both sides of the abortion issue ask is “Does life begin at conception”? The answer is a resounding Absolutely NOT. Life began long before your natural parents knew each other. As stated in Jeremiah 1:5, we were known to God and already had a purpose and ministry mapped before us. As well in Jeremiah 29:11, ‘For I know the plans I have for you, declares the LORD, plans for welfare and not for evil, to give you a future and a hope’. See scriptures here. An unborn child at conception is an eternal being that has a divine purpose that was first created and loved by God, second by his/her parents. Women have been entrusted with the incredible ability and opportunity to give life to an eternal soul created in the image of God! What an honor! Lawmakers that believed the abortion lie did not know God as Creator, nor did they know God as God at all. Think of it this way: if walking down the street you see someone that’s homeless – are you moved to help or pray for that person or do you think this person was a mistake because of that person’s circumstances? Answer that HONESTLY. Remember, God hears you. 56 days – all organs are functioning (stomach, liver, kidneys, brain); all systems are intact. 9th week – teeth begin to form; fingernails develops and the baby can now squint, swallow and can retract their tongue. It is at about the 9th week that most abortions are performed; it is also when the unborn child is complete – at this point, he/she only needs nourishment and time to grow. Romans 3:23 says, ‘For all have sinned and come short of the Glory of God’. All of us! Every Christian has failed, bar NONE. Actually, that makes me feel a bit better that I’m not the only failure! But thank GOD for forgiveness. In part 1 of Carrying the Bag, we defined what Life is in the eyes of God according to His living Word. Our lives were known by God long before our parents knew us. That simple statement reminds me how important my life is to Him and the Kingdom! But when we abort, we bind the hands of God from what that tiny life would have been capable of in the Kingdom. Talk about falling short of the Glory of God! When you aborted, you told God NO. Repentance brings forgiveness! Have you asked God out loud to forgive you? With forgiveness, now we can take responsibility for our sin: Psalm 32:5 says, ‘I acknowledged my sin to you, and I did not cover my iniquity; I said, “I will confess my transgressions to the LORD,” and You forgave the iniquity of my sin.’ King David is a perfect example of someone that really fell short of what God had for him, his repentance and his victory: ‘Create in me a clean heart, O God, and renew a right spirit within me,’ (Psalm 51:10). You ask, ‘Why did this happen to me? Why didn’t God love me enough to stop me?’ I assure you, He gives us every opportunity to NOT sin, but we are human. God either causes or allows heartbreak, grief, failure, death and sickness to allow us to grow in grace and knowledge of Him and His Word. Once we mere humans understand that His way is perfect, no matter how it doesn’t make sense to us; it is His Divine Will. Upon recognizing this, we can let go and let God. ‘The thief comes only to steal and kill and destroy. I came that they may have life and have it abundantly,’ (John 10:10). Now we can realize the responsibility of the abortion. We don’t walk away from abortion unscathed; it’s a horrible secret we carry around in a heavy, heavy bag everyday everywhere we go. How many years have you Carried the Bag? 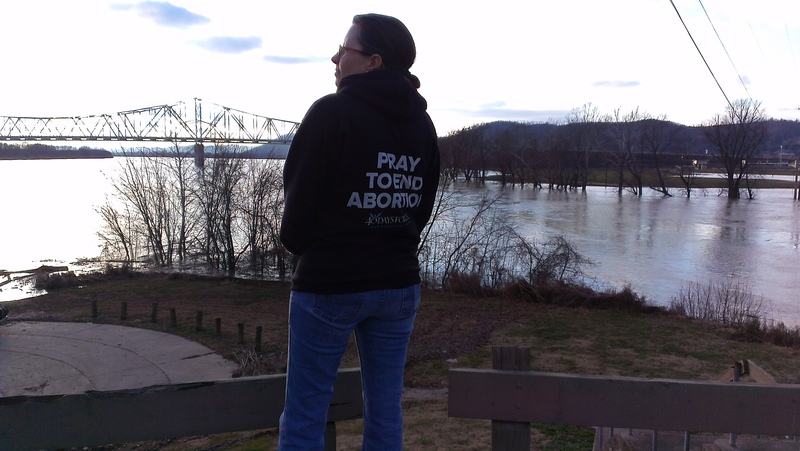 How has your life changed since the abortion? We need to recognize the constant battle being fought for our very soul. It is our persistence in the things of God and pressing toward the Goal – living a Cross-centered life – that makes the devil mad and makes us better women of God. We are Blessed and highly favored! You will never forget that day your abortion took place. But giving this burden to God is not only freeing to you but He wants you to! Through the horrific sin that David committed, he would still be blessed mightily by God – David and Bathsheba would later have another son, Solomon, who was one of the greatest men of God. Sin can breed sin OR we can learn from it. David repented and became a man after God’s own heart. The most important part of this particular scripture is that David knows he will see his dead son again in Heaven. Yes, babies DO go to Heaven! Have you walked around long enough feeling that God has let you down? ‘Yet we esteemed Him stricken’ – the Bible says that we viewed Jesus as a wounded man (Isaiah 53:4) before we understood the truth of Salvation. Jesus was not left alone to die on the Cross and you were not alone when you lost your baby. Nor are you alone today! You made a decision to abort, but would you make that same decision today? Of course not! You have learned through grief and loss that a baby’s life was taken – it wasn’t a fertilized egg, it wasn’t a blastocyst, it wasn’t an embryo, it wasn’t a fetus. It was a human life that God made in His likeness, ‘Then God said, “Let us make man in our image, after our likeness*. And let them have dominion over the fish of the sea and over the birds of the heavens and over the livestock and over all the earth and over every creeping thing that creeps on the earth,” (Genesis 1:26). One who sows discord among the brethren – those that caused the division and offense in your time of need instead of loving kindness keenly expressed by the Holy Spirit to give; weak churches & preachers that do not stand up for the rights of the unborn. “But he was wounded for our transgressions; he was crushed for our iniquities; upon him was the chastisement that brought us peace, and with his stripes we are healed,” (Isaiah 53:5). *‘Our image, our likeness’ refers to the Holy Trinity – Father, Son & Holy Spirit. The Apostle Paul wrote much of his epistles in chains – in prison. Paul understood that he had much to do for God regardless of his situation. Being in prison would seem like there was no hope, so why bother? But that’s not how God works, ‘I press on toward the goal for the prize of the upward call of God in Christ Jesus,’ (Philippians 3:14). Satan is still trying to restrain you from your call from God. You may still have fear and shame because of your abortion – you might still isolate and feel inferior. But God’s call is greater than that, ‘And after you have suffered a little while, the God of all grace, who has called you to his eternal glory in Christ, will himself restore, confirm, strengthen, and establish you,’ (1Peter 5:10). We have been SET FREE from sin! God is so good! He gave us Jesus to set us free from ALL unrighteousness – our sin is under His shed Blood! Satan no longer has a grip on your ON YOUR SIN! Spread the Good News of Restoration & Healing! There are many thousands of victims (women AND men) of abortion that are in your church, your neighbor, even your closest friend or relative that needs to tell their story about their abortion. Sharing with them can help set them free from the burden of Carrying the BAG. Your encouraging words can set the stage for healing and forgiveness to begin. Let God use you! Remember, 43%* of women are Post Abortive; 47% of Post Abortive women will or have aborted again. The only way we can stop abortion is one heart at a time. One baby at a time, one mom at a time, one heart at a time. *43% of women will have had an abortion by the age of 45.